LOS ANGELES, CA--(Marketwired - July 18, 2016) - BeMyDD (Be My Designated Driver), the nation's largest designated driver service, today announced it will be offering free designated drivers to residents of Houston on Saturday, July 23rd to get them and their cars home safely. "Social responsibility is a huge priority for us" said Arthur Simanovsky, BeMyDD president and CEO. "We're always looking for ways to make finding a designated driver easier than getting behind the wheel. The 24-City Designated Driver Tour is our biggest opportunity yet to positively impact communities all over the United States, and we are excited to make Houston, and the rest of Houston an important stop on our tour across the country." 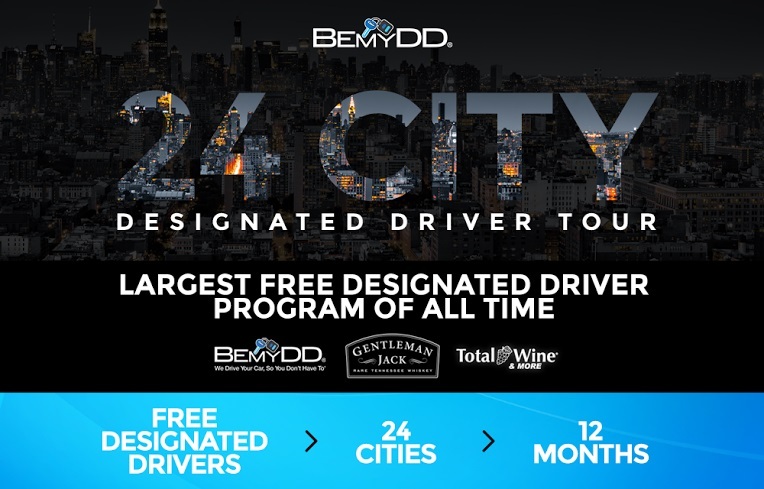 "The 24-City Designated Driver Tour is an excellent opportunity to promote responsible consumer enjoyment, which is one of our core brand values," said Rob Frederick, Director of corporate responsibility at Jack Daniel's parent corporation Brown-Forman. "This is a unique campaign that has our full support."